Dense foreboding jungle the color of a bone bruise, but vibrant with squalling life, spices and bursts of strange color. Its dangers leak from the body of a fallen god, decaying at its heart. The Jungle of Midnight is a unfinished country, prehistoric, where a tall, many layered canopy combines with heat and damp to create a steaming, shaded pit, full of obscenity - violent and base. All nature in the jungle is fighting for survival, choking, asphyxiating, writhing, fornicating and rotting away. Despite the startling blues and jewel greens of feathers and leaves, the jungle it is a place of misery, the trees live in misery, the birds live in misery - they do not sing only scream with misery. With an overwhelming misery, overwhelming fornication, overwhelming growth and an overwhelming lack of order, there is no real harmony as a human could conceive it in the Jungle of Midnight, only the natural harmony of overwhelming and collective murder. Bakesh, The - Liche (INT 18, WIS 18, CHR 16) HD11 (46 HP), AC 0/20*, ATK 1** freezing touch, ATK BONUS +12 to hit, DAM (2D6), MV 40’, SV MU 10, ML 10. * The Bakesh is ringed in powerful wards and is permanently under the effect of a shield spell, protection (effects Imperial Clergy/outsider entities) and protection from normal missiles. The Bakesh can elect to counterspell any spell attack against her instead of taking her next action which will negate the attacking spell and on a successful Save v. Spells reflect it at its caster. She also has the inherent abilities to speak with dead, detect magic, read magic and identify magic items (though it sometimes takes a while). **The Bakesh can levitate at will, and create powerful missile attacks that necrotize flesh, decay the inanimate and drain life in lieu of attacking with her touch. These attacks strike a single target as a magic missile (negated by the shield spell/save for ½ damage) for 11D6 damage or as a fireball like blast with a burst value of 11, doing 11D6/2 points of damage (save for ½ damage). She may also cast the following spells once per day: change self, sleep,comprehend languages, detect invisible, unseen servant, dancing lights, mirror image, darkness 15’ radius, audible glamour, stinking cloud, invisibility, ESP, phantasmal force, blink, fly, dispel magic, suggestion, fear, wall of ice, monster summoning II, minor globe of invulnerability, ice storm, confusion, animate dead, cloudkill, teleport, feeblemind, hold monster, wall of force, magic jar, death spell, freezing sphere, invisible stalker, grasping hand, monster summoning V, maze, mass charm, gate, time stop. It should be noted that all of the Bakesh’s spells are necromantic in nature and character: her stinking cloud smells of rotting flesh, her monster summonings will bring the undead, her unseen servant is a tormented spirit and her timestop pulls all effected into a shadowy spirit world. Should the Bakesh desire to cast alternate spells, she can with a day to prepare and as long as she is near her home and/or The Grimoire of Woe. The Grimoire of Woe - (6HD, AC 9/11 immune to normal weapons, ATK 1 Bite, ATK BONUS +7 to hit, DAM 1D10) An animate 6’ tall 4’ thick book of evil intent, anthropodermic pages and carnivorous tendencies that contains a great deal of arcane knowledge, including the vast majority of spells in a necromantic form and the process of transforming oneself into a liche. Unless mastered (a process that takes more than a lifetime of effort - the Bakesh has done it) it will require a successful grappling attack vs. the book’s strength of 12 (note as with all grappling efforts the book freely attacks the grappler) to open the book to a page that contains 1D6/3 random spells (Roll 1D10 for the level of each spell, on a 10 there’s no spell but some fascinating fragment of esoteric knowledge instead). Turning to a new page will require an additional effort in the form of another grapple and reactive attack by the grimoire. The Grimoire may only be opened by the intended reader. If the book successfully devours a reader it will add their soul and knowledge to its pages. The Bakesh normally looks like a wealthy Imperial noble in the comically outdated fashions of Ib and wearing an enameled mask of a woman with stately but sad features. Underneath she is a shell of carved ivory limbs filled with grave dust, ashes and fragments of bone. Beneath her mask is another mask of an ivory skull and beneath that the Bakesh’s original skull of pitted, burnt bone. If the Bakesh is challenged she can also call upon several charmed human guards/stranglers (3rd to 6th level fighters) wearing heavy scale armor and skilled in unarmed combat (damage with gauntleted hands is 1D6+2) or if truly concerned a hidden cohort of 20 armored skeleton warriors (HD 3/AC 16) and 6 wraiths under her control. She also has an 8HD flesh golem buried in her lovely formal garden, but it’s unreliable, berserking in combat and messy - the Bakesh would hate to call it up to hunt her foes as doing so would require digging through one of her favorite topiaries. *Hex Ruttergund has the following spells memorized, but might be convinced to memorize more combat oriented spells if he had to: detect magic, read magic, unseen servant, detect invisibility, rope trick, ESP, tongues, suggestion, hold person, polymorph other, polymorph self, dimension door, teleport, contact other plane. Coward’s Ring ugly squared brass ring with 6 charges - AC 12 protection and if wearer is attacked in melee, ring will cast mirror image with 3 images using 1 charge. Ruttergund can recharge it, but it’s an annoying chore. Wand of Ashes and Sighs A tooled steel rod with a burn scarred tip - 12 charges - Cone of hot ash 1 target in melee, BV 8 at short range - cause D6 damage and humans/humanoids save vs. spells or collapse, paralyzed and weeping at the injustice of the world for D6 rounds). Ruttergund can recharge it, but it’s an annoying chore. Hex is a fussy, dusty man with a pot belly who often has egg in his mustache. He wears expensive, old, threadbare, clothing that is unfit for the climate and has only several elderly servants to attend him. His rather extensive and cluttered laboratory/library is concealed behind a secret door and several strong wards. Ruttergund trapped a 10HD earth elemental several month ago (compressed to melon size in a sphere of elemental water) and is interrogating it for the secrets of transmuting minerals. It is very, very angry. Hatred of War - Blessed and sanctified by the Beaked God, this golden scepter of office is ornately decorated with scene of warriors in feather like armor arriving in a pastoral paradise. It can be used as a weapon effectively (as mace) against even spectral and other weapon immune targets. On a natural attack roll of 16 or above it will entirely shatter the weapon, shield or armor (wielder picks) of a target. It cannot destroy natural armor or weapons, or those that are themselves magical. As a mace the scepter has the standard ‘penetrating’ +2 bonus against heavy and medium armor. 99 Psalms of the Beaked God - Written in tiny gold letters on translucent leaves of thin blue jade (Worth 5,000 GP as an art object and fragile), this holy book is the liturgy of the Beaked God written in a dead language. While holding it the owner can speak (or more precisely sing) and understand the language of birds. Most birds are quite idiotic, boisterous and petty - with nothing to discuss except egg size, bird pecking orders and braggadocious plumage grooming tips. Rook Devi wears artifacts of the Beaked god over a blue silk loincloth embroidered with golden designs, aping the style of the jungle’s autochthons. Rook has money and connections and can call upon several house guards (fighters) of 2nd to 4th level in bronze plate armor (AC 17) who specialize in unarmed combat (attack with feet and hands for 1D6+1 damage) or hire mercenaries for any expedition he mounts. Every wilderness adventure needs a starting point and the tradition for "Jungle Adventure" is to start in an exotic port - a polyglot and strange place filled with sailors, wanderers and mysteries that startle the civilized explorer. The use of North African tropes is traditional for building the liminal space between the civilized 'North' and the unsullied, wilderness, unexplored 'South' and I don't think I've entirely avoided it here. I'm not sure what Undefended Ib is beyond a dingy timeless place of exile for the Fallen glories of Empire. Clearly remains the entrepôt for decadent jungle trade goods, but it was once more I think - a legion fortress city - the ultimately precarious distant limb of Imperial overreach, unaware that its body is as dead as the ghost legions that guard it. Sleepy and decadent, the far outpost of a dying empire and home to exiles, ghosts and depravity. Weapons are forbidden in Ib as to carry them breaks an ancient compact with the city’s ghostly protectors. Beyond the fecund waste of the Sea of Grass, past the square peaks of the Ravening Mountains and the great demon corrupted sink of the ever burning Heart Provinces is the Jungle of Midnight. The crumbling spires of the Undefended Citadel of Ib erupt from the headwaters of a long nameless river on the Hook Shore beyond the Inner Sea, where the ghost herons hunt in the shallows waiting for fish to swim between the transparent shears of their glassy beaks. A few traders sail there each year, spending months on the tossing salt waves with the haunted shores of the Old Empire to the North, enduring in anticipation of the wealth a hold full of dangerous foreign cargo will bring. The town of Undefended Ib is a small port on ancient slime covered pilings of black alchemical iron. No man is allowed to bring weapons into Ib’s streets for fear of calling a tide of spirits down from the citadel above. The few ancient nobility, their ancestors exiled here to rot happily among the tropical breezes and narcotic blue mango of the jungle, keep a languid peace by employing enormous wrestlers, stranglers and pugilists or resolve disputes by contests at drunken poetry. The common people trade in goods from the jungle, most traded from the lantern eyed men of the interior. Black jaguar skins, glowing cockatrice feathers and potent drugs are exchanged for bronze spear heads and glass beads. The town itself consists of nine crumbling late Successor Empire mansions, stone block and riveted arcane steel wedding cakes eight to ten stories high, dwarfing the riverstone and thatch huts, warehouses and market of the trade town below, but equally dingy and small in the shadow of the massive black spires of the Undefended Citadel of Ib. Like four of the mansions, and the top five or so floors of the others, the citadel is utterly abandoned. In my recent review of Tomb of Annihilation I mentioned that I'd started work some time ago on a jungle adventure and included some bits of it. Some people seem to have enjoyed the small parts of the unfinished work that I shared, so I'll do some editing and maybe put up bits and piece in more or less sequential order here until I run out. An ancient deity rots on a distant jungle shore, and promises immortality and wealth to those who are unafraid of meddling in the Gods’ cruel games. A legend popular among those who find both present regimes and their opposition oppressive, especially those dusty secret cabals that claim long memories, is that of the Hated Pretender. The story is that of a cruel ‘false’ emperor in a time before the current powers of earth and heavens who battled even the primal deities of his age, and who in defeat still spited his enemies among the gods. Once the great Demesne of the Pretender stood supreme among nations, its glory tainted by the obscene cruelty that its hated master used to shore up its power, build its magnificent works and spread its influence. The Pretender’s foes were many, and many fell before his numberless armies and his ever more powerful champions. Only those who joined the Demesne as lesser lords survived. Alone, the Theocracy of the Beaked God didn’t break, and in the end the Pretender’s frontiers crumbled before the paladins and interventions of their avian deity. Knowing defeat was imminent The Pretender sought revenge and sent his greatest divisions, led by a cadre of most powerful champions, to penetrate the heart of the Beaked God’s realm, his holy city, where they were to ascend to his throne in the firmament and assassinate the God. As the Pretender’s allies turned against him below, his cities burnt, and his armies fell one after another, the heroes of his cause succeeded above and from the crumbling towers of his scourged capital the Pretender watched the blue comet of the Beaked God’s fall. Few now know of that holy city’s existence, and fewer its location in the hungry vastness of the Jungles of Midnight, but it is still there, the remains of its shattered god nearby, immortal but ravaged and trapped in a nightmare of pain and insanity. The ancient city and divine flesh offer many reasons to travel there for those brave, well equipped and foolish enough to do so. The most obvious is treasure - both in the form of the city’s golden decorations and the divine flesh of the Beaked God - a magical panacea. Other motives include retrieving the weapons used by the Pretender’s agents, which are likely some of the few in existence capable of harming the divine, or even resurrecting the Beaked God on behalf of his diminished and secret cult. Conversely there are still deities that remember the primitive Beaked God, but wish what is left of him destroyed as they hope to absorb the morsel of power that remains in the Beaked God’s shattered form, and are willing to risk mortal pawns like clerics or paladins to do so. The Rumors below will provide an interested party of fortune hunters with a rare means to locate the fallen god. Another 203 page behemoth from Wizards of the Coast. I’ve read Out of the Abyss, Curse of Strahd, even Hoard of the Dragon Queen and more, and everything from WotC these days is over 200 pages. They aren’t all entirely bad, but they all contain the same grievous failings, failings that one can guess from the fact that the teams writing them often appear to have little experience doing professional writing for editions of Dungeons & Dragons prior to 3.5. Even with 5E adventures that have stronger open world elements, such as Out of the Abyss and Curse of Strahd (both also headed by Chris Perkins) have a devotion to scene based adventure design, excessive backstory, muddled text lacking evocative detail, a focus on set-piece combat as the default solution/climax of any scenario, a disdain for both player critical thinking ability and GM choice. You end up with a huge volume that’s so optimized for a GM to read it like a novel that it is almost unusable at the table, and when used, focused on dragging the players along a specific story and campaign arc in a largely predetermined way. This and all other art appears to be promotional imagery for the adventure or related (videogames, boardgames) products. A first sign of hope is that the writing team wasn’t entirely the same with Tomb of Annihilation. Steve Winter was involved and has a long history with earlier games: Star Frontiers, early Dragon and as the writer of Ruins of Adventure (The basis for Pool of Radiance). Even Chris Perkins who has been a lead writer for Wizard’s later editions and 5E products provided an adventure to Dungeon Magazine Issue #11, that Bryce of 10-Foot Pole describes as “A tournament module, with scoring. It revolves around a four-level keep/castle with about fifty rooms in it. The party has to make their through it to the end. The two major occupants are betting on the parties outcome and if they’ll make it, with the adventure eventually ending with the party fighting both of them. It’s not terrible for a tournament adventure: it’s self-contained and there’s a decent amount of variety in the encounters as well as options available to the players in navigating the keep.” Pretty high praise from him for anything published in Dungeon. WIll Doyle and Adam Lee are newer game writers who seem to mostly have worked on 5e product. Despite having some writers who might understand how location based adventure design works, and presumably have run games where the most important use of a written product was providing a skeleton and overview of a location or set of locations for players to adventure in rather than providing pages of boxed text to read aloud as justification for moving from complex tactical combat to complex tactical combat, Tomb of Annihilation doesn’t start with much promise. Like every other Wizard’s product Tomb of Annihilation promises epic adventure that will raise a party from low level (1st) to high level (11th). Using 5th Edition’s default experience points for bloody handed killing this means a lot of dead monsters. The book that follows includes its share of the rest of WotC’s big design flaws (copious read aloud text, promise to adhere to larger underlying story, dense writing that conceals important location aspects/elements, requirements for the Monster Manual to determine enemy strength and assumptions of PC morality). 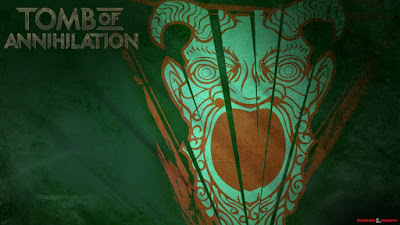 More hopefully Tomb of Annihilation is a throwback and an intentional re-framing of Tomb of Horrors (It includes the infamous Acererak) and Dwellers of the Forbidden City. Like the unofficial marketing for Tomb of Horrors, Tomb of Annihilation claims to be exceptionally deadly to characters - with the suggestion of an optional “meat grinder” mode (which amounts to a harder death save), and a story mechanic that makes character death more or less permanent. There are even a few words on providing replacement characters for the dead. Despite my initial foreboding Tomb of Annihilation won me over - it's by no means a great adventure, but it's solid, interesting and usable in a way that prior 5th edition products haven't been. It's hard to know exactly where to start and stop the next set of monsters from Monsters and Treasure, bestial creatures that are (with one interesting exception) pulled directly from classic myth and legend. These creatures are best described as "Dragon-like", but depart from the common structure of Monsters and Treasure in that they don't represent a hierarchy from weakest to strongest within a specific monster class. Manticores ("Manticoras"), Hydras, Chimeras and Wyverns don't really share much descriptively or in any conceivable ecology, though all have some special attack, all appear in small numbers and all are dangerously powerful with 6-12 Hit Dice and decent armor class. They seem to exist to provide a lone alpha predator, menace or 'boss monster' when dragons aren't appropriate. This is somewhat unfortunate as most of these creatures are quite evocative and offer interesting encounters. MANTICORA: Huge, lion-bodied monstrosities with men's face, horns, dragon wings and a tail full of iron spikes. There are 24 of these spikes in a Manticora's tail and they can be fired 6 at a time in any one direction with the range (18") accuracy and effect of a crossbow. Their favorite prey is man. As a 6+1 hit die creature with great speed (12/18) and a good AC of 4, Manticores seem like they would be excellent hunters of man - and in the ancient Persian that provides the name it translates to "man eater". They mythological Manticore seems to be one of those monsters of spirits of the wasteland that explains why shepards, hunters, travelers and herdsmen go missing and thier bodies are never found. Allegedly the mythical beast devours its prey whole after stunning with it's poisonous sting. As a monster the Manticore as a mechanical concept is far less interesting then it's parts imply. It's a burly ranged attacker (though limited to one attack in melee) that can launch a dangerous (an with an attack bonus of +6 or the ability to hit a plate and shield armored character on an 11 or better) flurry of missiles. The mechanics of the Manticore's missile attack present interesting possibilities, in that it can target a single enemy six times in a round at range, picking off magic users and other dangerous but unprotected characters. Played with the human cunning that it's man's head implies a Manticore could be very dangerous, sniping party members from ambush and flying by to kill at long range. One envisions them as predators and raiders, flying, retreating to filthy bachelor lairs in the wastelands, decorated in stolen frivolities and aping humanity, but scattered with bones and bloody bits of meals. Goblin Punch has this lovely piece on Manticores, making them more mythical then the original myths of confused man faced and poison tailed tigers, or the later ones of cats with the faces of beautiful spiteful women, confused with the sphinx and as an allegory for fraud. More recently Trey at Sorcerer's skull released his Manticore wizard focused adventure which takes the beast in a somewhat different direction but still focuses on the It's hard not to think of Manticores as the idea of a monster in need of more interesting statistics.